The Big Apple Bank teller is a teller who works at Big Apple Bank, Fry's bank. 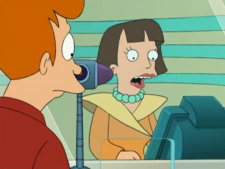 She told Fry his balance of 93 cents grew up to $4.3 billion in a thousand years (1ACV06). She later opened a retirement account for him before Roberto robbed the bank (3ACV11). She was also a witness at Santa's execution, unaware that it was actually Bender, who was innocent for once. When the real Santa burst in with a laser machine gun, he fired at the teller, though she managed to escape. Big Apple Bank teller: Hmm. We don't seem to have your retina scan, your fingerprint or your colonic map on file. Fry: Yeah, well, I did open the account over a thousand years ago. What about my ATM card? Big Apple Bank teller: You're opening a retirement account for $6? I'm sure a wealthy[sniffs Fry]mule farmer like yourself is aware that we charge a $10 monthly fee. Fry: You gotta spend money to make money. Big Apple Bank teller: Here you are, sir. Your account is now overdrawn by $4. This page was last edited on 11 October 2014, at 11:05.